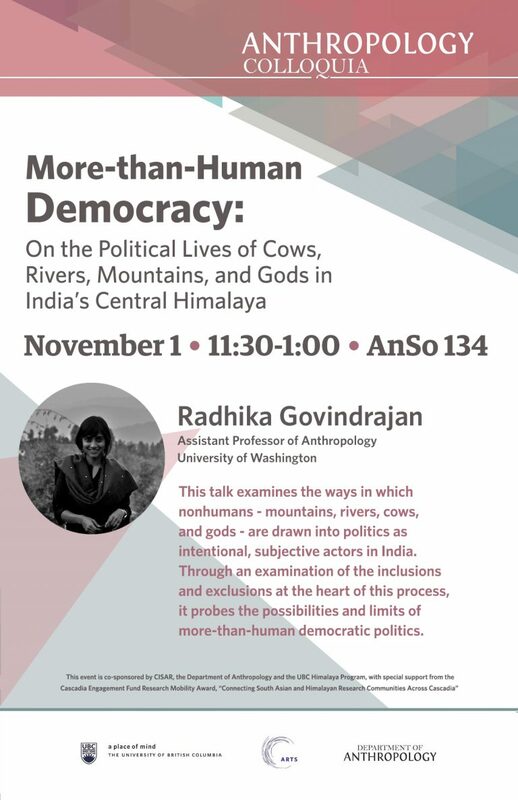 This talk examines the ways in which nonhumans – mountains, rivers, cows, and gods – are drawn into politics as intentional, subjective actors in India. Through an examination of the inclusions and exclusions at the heart of this process, it probes the possibilities and limits of more-than-human democratic politics. Radhika Govindrajan is an Assistant Professor of Anthropology at the University of Washington. Her book, Animal Intimacies: Interspecies Relatedness in India’s Central Himalayas, was published by the University of Chicago Press in 2018. She is beginning work on a new project that examines the ways in which democratic politics in India contends with the nonhumans.